for sand. The sand box was kept filled with beach sand, which was bagged as needed for various construction projects. The rock crusher shut down operations in the 1920s, but the sand box remained on the beach for many years, giving the beach its once-popular name. 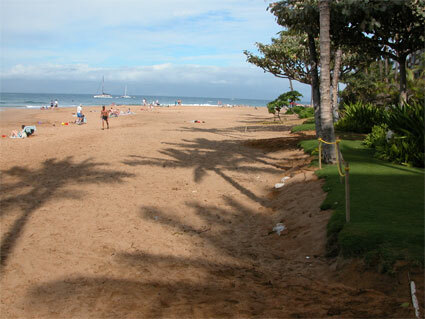 Hanakaʻōʻō Beach Park is located between Wahikuli State Wayside Park and the Hyatt Regency Maui. The beach fronting the park is the beginning of the long stretch of sand that runs for a mile to Puʻu Kekaʻa or Black Rock in the center of Kāʻanapali. The park is heavily used by swimmers, snorkelers, and picnickers. The shorebreak that forms on the beach attracts bodysurfers and bodyboarders. The nearshore waters offshore the beach also provide boaters with a popular summer anchorage. Facilities in the park include picnic pavilions, restrooms, showers, paved parking, and a canoe storage shed for the outrigger canoe clubs who use the park as a practice site.